'Man of Steel' is caffeinated action-adventure superhero fantasy, which follows director Bryan Singer’s underrated attempt to resurrect the franchise in 2006 with Superman Returns, addresses the Superman myth on the 75th anniversary of the original comic book. Man of Steel is the origin story of Superman, certainly one of the most recognizable, iconic, and beloved movie characters of all time. British actor Henry Cavill (playing both caped Superman and his alter ego, Clark Kent) is supported by a veteran, Oscar-nomination-credible ensemble that includes Russell Crowe as Jor-El, Supe’s Kryptonian birth father; Kevin Costner and Diane Lane as Pa and Ma Kent, his adoptive human parents in Smallville, Kansas; Amy Adams as reporter and romantic interest Lois Lane; Laurence Fishburne as Daily Planet editor-in-chief Perry White; and Michael Shannon as Kryptonian villain General Zod. The lead character is an alien with superpowers and, instead of Kryptonite, a measure of loneliness and ambivalence and uncertainty about his place and role on Earth. He has come from the dying planet of Krypton and is adopted by the Kents, then goes on to become a protector of the people of Earth, but he remains an outsider. So there’s angst on display, but it’s trumped and eventually smothered by body-slamming action sequences that just don’t know when to quit. We, however, do. Director Zack Snyder (300, Watchmen, Sucker Punch) — working with producer Christopher Nolan and screenwriter David S. Goyer, whose screenplay emerged from the revisionist story by Nolan and Goyer -– is so enamored of CGI special-effects pyrotechnics, incendiary explosions, and frenetic fistfights between super-creatures that he ignores the film’s underdeveloped characters and its speechifying dialogue, leaping over plot holes in a single bound. His slant on the familiar material is melancholic, which is fine. But it’s also real close to pure action escapism. Humor is, for some reason, in strangely short supply, making us yearn for 1978’s entertaining Superman with Christopher Reeve donning the cape for director Richard Donner and self-parody a significant and tasty ingredient. It’s also a reminder that Superman movies are allowed to be fun. In fact, so intent is director Snyder on showing off the latest in snazzy special effects that the film does eventually turn into -– and I mean this as the most incriminating of insults –- a Transformers flick. Explosion after explosion, destruction on a mass scale, and absolutely endless one-on-one fighting between Kryptonians is the working definition of a bloody bore. Superman may be faster than a speeding bullet, but, at nearly 2½ hours, the film itself is anything but. And enough already with the 9/11 imagery: it’s understandable as an element here, but at some point we begin to feel the trivialization of that tragic real-life event. So we’ll duck into a phone booth (remember them?) 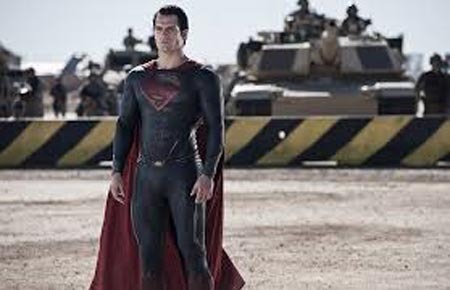 and change into 2 stars out of 4 for Man of Steel, a loud, bone-crunching, patience-testing retelling of the Superman legend. You don’t need x-ray vision or 3-D glasses to see how joyless and bloated this version is, and you won’t have a ball watching this brawl.